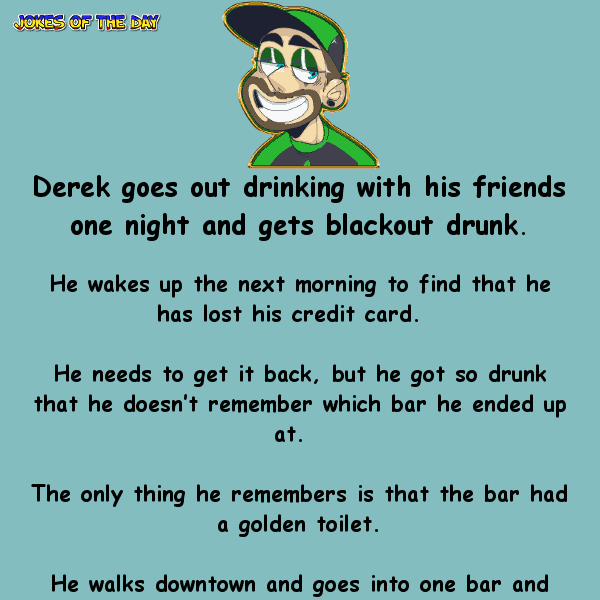 Derek goes out drinking with his friends one night and gets blackout drunk. He wakes up the next morning to find that he has lost his credit card. He needs to get it back, but he got so drunk that he doesn’t remember which bar he ended up at. The only thing he remembers is that the bar had a golden toilet. A golden toilet? I don’t think so,” the bartender said, giving him a strange look. The man walked into another bar,” Excuse me, you don’t happen to have a golden toilet here, do you?” said Derek. This continues all day until finally Derek walks into a bar all the way on the other side of town.